Do you know that I discovered a very interesting fact today? That a total of close to 4 lac GLTRENDS men and boys are searching (just on Google) for ways of, what is known (in India) as “proposing a girl”. * Now that’s quite some number. Photo by [email protected]So are you in love? 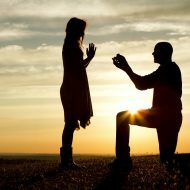 Are you planning to propose to the girl of your dreams? For your benefit, in this post I’ve decided to share the most creative 10 ways of “proposing a girl”, i.e. letting a girl know of your romantic feelings for her. But remember, before you propose a girl, you need to work through your inhibition, and also choose the best possible time to propose her. Get a plain white round-neck t-shirt printed with “Sheetal (or whoever), I love you. J” It’s even better to get creative with the t-shirt message. Wear it inside a jacket or shirt and go to work/college or wherever it is that you regularly meet your love-interest. Try to catch her alone and reveal your gift to her with a smile.